Members of the River Valley wrestling team pose for a picture after winning the Jackson American Legion Post 81 Wrestling Invitational held Saturday in Jackson, Ohio. JACKSON, Ohio — A solid start to an optimistic season. The River Valley wrestling team came away with top honors at the 13-team Jackson American Legion Post 81 Invitational held Saturday at Jackson High School in the Apple City. 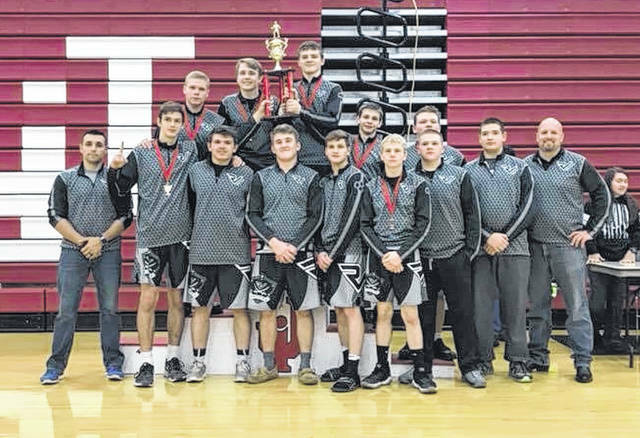 The Raiders had four weight class champions and seven top-four finishes en route to a winning tally of 229.5 points, which was 23.5 points better than the rest of the field. The Silver and Black also had the most divisional champions of any team in the annual event. Westfall was the overall runner-up with 206 points, while the host Ironmen landed third place with 181.5 points. Point Pleasant had a ‘B’ team at the event and placed 11th overall with 59.5 points, while Meigs was the only other local program at the event and placed 12th with 45 points. RVHS received first place efforts from Joseph Burns (113 pounds), Jacob Edwards (126), Jeremiah Dobbins (160) and Eric Weber (170), while the trio of Coalton Burns (120), Nathan Michael (182) and Dakota Doss (285) all came away with third place finishes. Edwards and Weber had the most-productive days from that group after each went 5-0 with five pinfall victories en route to division titles, while Joseph Burns was 4-0 with three pinfall wins and a technical fall. Dobbins also finished the day 5-0 while recording three pinfall wins and a technical fall. Michael went 4-1 overall with three pinfall wins, while Doss was also 3-2 with two pinfall victories. Coalton Burns ended the day 3-2 and scored three pinfall victories. The Big Blacks — whose primary squad competed in North Carolina over the weekend — did muster one weight class champion and one runner-up finish, both of which came in the same weight class. Christopher Smith defeated Parker Henderson in the 106-pound final by a 17-2 count for a technical fall. Smith ended the day 4-0 with three pinfall wins, while Henderson was 5-1 overall with two pinfall victories. The Marauders landed just one top-four effort as Tucker Smith placed fourth at 132 pounds. Smith finished the day 3-2 overall and scored two pinfall victories. Westfall trailed only River Valley after securing three weight class titles. Unioto, McClain and Zane Trace each landed two divisional champions, while PPHS scored the other individual crown. Visit baumspage.com for complete results of the 2017 Jackson American Legion Post 81 Invitational.